Hi Everyone! This is one of those magic recipes that is quick, easy, and was born out of needing a quick meal out of what I had in the house. The key to this seems to be a new tortilla I found, which was half wheat and half corn, Handmade Style Tortillas from La Tortilla Factory. Heat your skillet to medium high heat, and place your tortillas down. 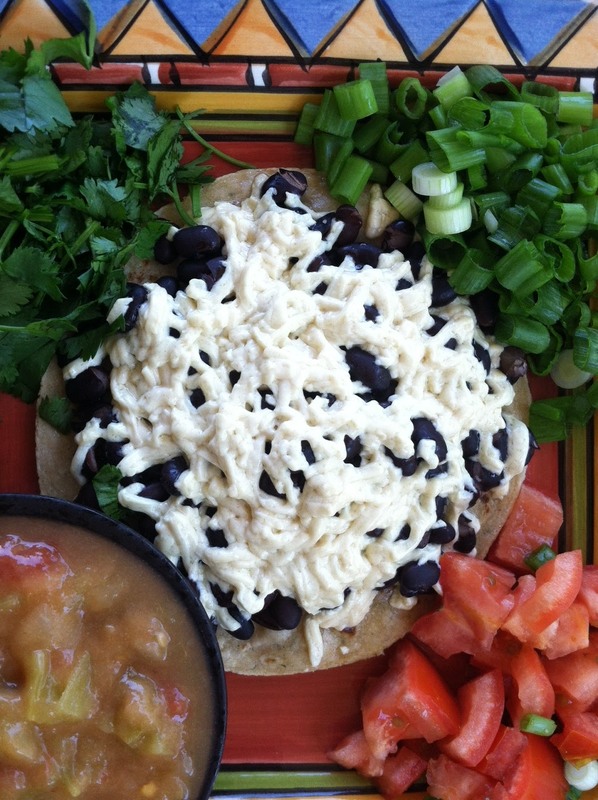 Add ½ cup of cooked black beans, and ¼ cup of daiya cheese or other shredded vegan cheese. Cover and while the tortilla is steaming and cooking, dice tomato, slice green onions, and mince cilantro. Once the ‘cheese’ is melted, transfer your tortilla to a plate, top with veggies and salsa. Really, that is it. I love it, love it, love it. It makes a delicious breakfast and I can’t wait to make more. Word.